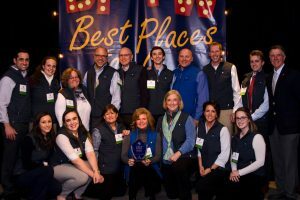 MONTPELIER – Union Mutual is proud to announce it was recently named one of the 2018 Best Places to Work in Vermont. This is the fifth consecutive year that the Company has received this award. The 12th annual list of the Best Places to Work in Vermont was created by Vermont Business Magazine, the Vermont Chamber of Commerce, the Vermont Department of Economic Development, the Vermont Department of Labor, the Society for Human Resource Management (SHRM) – Vermont State Council and Best Companies Group. “Union Mutual does an exemplary job of balancing the task at hand – being a for-profit business – with also keeping employees engaged, challenged, rewarded and satisfied. Having worked other places, there is no way a better company exists than this one,” a Union Mutual employee commented in the anonymous survey. This statewide survey and awards program is designed to identify, recognize and honor the best places of employment in Vermont, benefiting the state’s economy, its workforce and businesses. The 2018 Best Places to Work in Vermont list is made up of 50 companies.